Time is running out fast on the Holstein Foundation online ArtSale. Here’s a place to get some holiday shopping out of the way in advance. Bidding in the Holstein Foundation ArtSale will close December 1, 2005 at 5:00p.m. EST. Visit www.holsteinfoundation.org to view the Art Sale Catalog and bid on your favorite piece. The high-quality paintings, ceramics, and sculptures, all relating to dairy cattle, make perfect holiday gifts. All proceeds from the Holstein Foundation Art Sale benefit Foundation programs. Bidding is expected to be very busy on December 1, so make sure your bid is the last one! For any questions relating to the Art Sale, or to phone in bids on December 1, please contact Jess Strout at 800-952-5200, ext. 4128 or jstrout@holstein.com. Here’s an interesting item about the raw milk situation in Washington state. This is from an AP story. Basically, it looks like the Washington state dept. of agriculture wants people producing and selling raw milk to be licensed and regulated or shut down. To combat this 2 groups have been formed, the Washington Association of Shareholder Dairy Owners and Raw Dairy Choice Campaign. I can’t remember when I’ve had raw milk. I know it was in my bottle as a baby since my grandfather had a dairy next to where my home was. But then we started getting it delivered in bottles and pasteurized. Nowdays we get it as 1%, 2%, etc. I only like it whole myself. The story mentions microdairies. Kind of sounds like micro breweries. A nice place to go get a cold bottle of freshly bottled home brew, er, milk. Somehow we didn’t get the latest news from the Callicrate Bander posted here but that’s easy to fix. You can link to the full release which has sound bites included that you can listen to on your computer. A popular castration device is proving adaptable for a wide variety of other animal health procedures, according to livestock producers and veterinarians. (St. Francis, KS) The Callicrate Bander was developed as a tool for low-stress, bloodless, user-friendly castration that enables cattle on feed to maintain high performance levels. However, the ligation capabilities of the Callicrate Bander, which is designed and handcrafted in the U.S., also lends itself to a variety of other animal health treatments. Tom King, an independent marketing representative from Oshkosh, Nebraska says he continues to see new uses for the bander, especially among livestock veterinarians who use it when they need a sanitary way to shut off blood supply for operations. The meeting, led by newly elected Holstein President Randy Gross, was a successful and productive exchange of ideas, discussion and action. Registrations continue to grow – 248,729 animals have been registered through the end of October 2005, an increase of 3.9% from 239,430 in 2004. Animals transferred through the end of October are: 47,684 compared to 47,709 at the same time last year. Classification activity is up 4.6% from last year, 167,419 animals have been classified through the end of October, in a total of 4,184 herds, compared to 3,916 herds in 2004, an increase of herd activity of 6.8%. The Board approved the recommendation of the Junior Advisory and Youth Activities Committees to denote Louisville, Kentucky as the site of the Grand National Junior Holstein Show, along with the remaining five designated National Junior Holstein Shows. The Board approved changes to the delegate reimbursement policy, effective with the June 2006 Annual Meeting. All delegates who attend the entire Annual Meeting will be reimbursed $400 for their expenses. 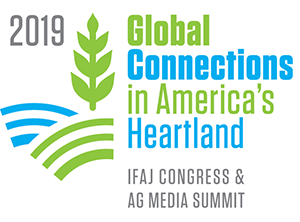 The Board received various committee reports including the Audit, Holstein Breed of the Future, International, Show and Junior Advisory Committees. Chief Financial Officer, Barbara Casna, reported the Association is projected to have another very healthy year in 2005, with net operating results forecasted to be $951,000. Total revenues through October 2005 are $11,800,000 which is an increase of $303,000 from last year or 3%. The Holstein Association Reserve Fund on October 31, 2005 was valued at $21,591,000, a gain of $551,000, or 3%, since January 1st. Holstein Association staff presented the 2006 Management-by-Objective Business Plan to the Board of Directors. The plan was approved. The Board welcomed representatives of Monsanto Company, Roger A. Cady, PhD and Shay Sunderland, PhD for a discussion on the future of the dairy industry. Hello World Dairy Diary fans. We’ve taken an extended break from posting to work on some other projects and determine where we go from here. Where we go is basically this. We’ll begin posting dairy news from around the world on a regular basis immediately and are seeking sponsors! We really appreciate our original 3 sponsors and will keep their logo/links up for the time being. So, look for much more to come. It’s late but I’ll have more news starting tomorrow. I promised I’d provide you with an online photo album from World Dairy Expo and I finally got it done. I took 262 photos during Expo and uploaded 201 of them. So there’s a lot to look at. Many of them were posted to World Dairy Diary but these are larger and unedited. This link – World Dairy Diary Photo Album – will take you to the Flickr photo album. You can look at them individually or as a slideshow. You can download them too. If you use them, just give us credit please. I hope you enjoy them. It was fun taking them. Are you a college student looking for a summer internship? Here’s an opportunity. If you’re not a college student, maybe you know one you could pass this opportunity on to! College students pursuing a bachelor’s degree in dairy science, animal science, agricultural economics, agricultural communications or related agricultural fields may apply for these internships. Applicants must be familiar with cattle pedigree information. Previous judging-team experience is an advantage. While important for all internships, strong writing and computer skills are a requirement for students working in corporate communications. Sire-department interns must have experience working with cattle, and the ability to clip and prepare animals for still or video photography. For more information about these internships or to submit a resume for consideration, visit http://www.selectsires.com/internship.html or send an e-mail message to info-line@selectsires.com. This is a two blog post. That means that it will appear on AgWired and on World Dairy Diary. Why? Because these folks did a great media relations event at World Dairy Expo and they have new product news. They are Virtus Nutrition & Lallemand. Now I don’t know about you but it’s not easy to understand and write about what these folks make. However, they did what it took to get the media there and “explain” it. We were invited to a wine tasting/product discussion. I missed the introduction so I never did fully understand the relationship between Virtus and Lallemand, except that Lallemand manufacturers and Virtus distributes. However, Lallemand makes yeast and yeast is used in wine making. In fact, we learned that most of the wine made in the world uses Lallemand manufactured yeast! Yeast is also used in animal nutrition and there are different kinds of yeast that produce different kinds of results. So, what they did was have us taste 3 different kinds of wine that were made with all the same ingredients except that the yeast for each was different. They all tasted different and this demonstrated the whole point of the presentation that followed on animal nutrition! Very creative and very well done. Besides, they brought in a wine expert, Lallemand’s own Bob Charley, who is a forage products manager. He was excellent. In fact, the wine was excellent. The best part was leaving though and receiving a 2-bottle wine holder with corkscrew and a bottle of red and white inside! I only have the white left. They stocked the holders with New Glarus Primrose Winery products, which was also a good idea since we were in Wisconsin and the winery is located in New Glarus, WI. Let’s do it again Lallemand & Virtus. Virtus Nutrition, headquartered in Fairlawn, Ohio, today introduced Strata G™ with Omega-3 Fatty Acids, the first in a line of new products to appear under the new Strata G brand name. “Strata G products feature specific fatty acids, such as omega-3’s, that are meant to be strategically fed at a specific time for a specific result,” said Scott Sorrell, Director of Marketing for Virtus Nutrition. Now’s the time to get your dairy holiday shopping done online and help out a good cause. It’s the first ever Holstein Foundation online Art Sale! The high-quality paintings, ceramics, and sculptures, all relating to dairy cattle make the perfect holiday gifts! All proceeds from the Holstein Foundation Art Sale benefit Foundation programs. The Foundation will accept bids on these special art pieces until December 1, 2005. Make sure your bid is the last one! National animal ID is heating up as various systems and government certification programs are starting to be implemented. In the dairy business there’s a new coalition of groups working together to create a system. One of those is iDAIRY of which Holstein Association USA is a founder. Holstein Association USA, Inc. is a founding member of IDairy, the new coalition of six leading dairy industry organizations working to facilitate a national animal ID system. “The Holstein Association believes there is an urgent need for a mandatory national animal ID system in the United States to allow the government to respond quickly and effectively to an animal health emergency,” said John M. Meyer, Chief Executive Officer of the Holstein Association USA, Inc. 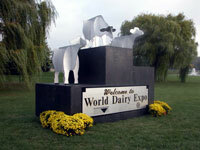 Announced Thursday, October 6, 2005 at the World Dairy Expo, IDairy unveiled a three phase approach to secure the dairy industry’s role in the national animal ID system. The first phase is for all dairy and livestock producers to register their premises; the next step is for each animal to be identified and the final phase is the transfer of data from individual systems to a national database. The IDairy group hopes to have all dairy cows identified prior to the 2009 goal set by USDA. Dairy and livestock producers can visit the newly launched IDairy website: www.idairy.org to complete the first phase of the coalition’s plan: registering all agricultural premises. The IDairy website is the industry’s source for the most up-to-date information about national animal ID and the founding organizations: Holstein Association USA, Inc., American Jersey Cattle Association, National Association for Animal Breeders, National Dairy Herd Improvement Association, National Milk Producers Federation and Professional Dairy Heifer Growers Association.